Libby Hall never really wanted to be noticed. But after she saves the children in her care from a fire, she finds herself headline news. And horrified by the attention. It all reminds her of what happened nine years ago. The last time she saw her best friend alive. Which is why the house swap is such a godsend. Libby and her husband Jamie exchange their flat in Bath for a beautiful, secluded house in Cornwall. It’s a chance to heal their marriage – to stop its secrets tearing them apart. But this stylish Cornish home isn’t the getaway they’d hoped for. They make odd, even disturbing, discoveries in the house. It’s so isolated-yet Libby doesn’t feel entirely alone. As if she’s being watched. Is Libby being paranoid? What is her husband hiding? And. As the secrets and lies come tumbling out, is the past about to catch up with them? 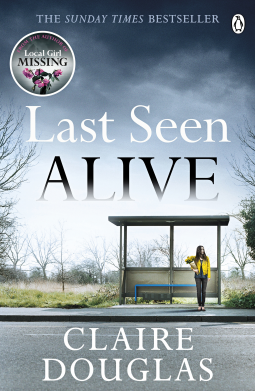 Last Seen Alive is the first novel by Claire Douglas that I’ve read and I loved it. It’s everything the blurb promised, and the secrets and lies never stop coming, right up to the end of the book. To write too much about the plot would only spoil it – you have to experience it as you read to get the full impact. I can only say that right from the beginning of the book I was hooked as Jamie and Libby arrive at their house swap in the Roseland Peninsula in Cornwall (I’ve been there – it is beautiful) and I felt the suspense and tension as they explored the house by the sea. It’s a remote detached rectangular house with a round turret at one end and inside it had been recently restored. They are dismayed by the contrast with their poky two bed flat in Bath. Immediately alarm bells are going off in Libby’s head, what were the owners’ real reasons for wanting to swap this house for their little flat? Strange things happen, Libby’s fears escalate and then Jamie begins to question her about her past. He knew that Karen, her best friend had died in a fire when the two of them were in Thailand and that Libby had been lucky to escape. But she doesn’t want to talk about that and she knows that he is keeping things from her too. Then Jamie comes down with a bad attack of food poisoning and ends up in hospital. Their stay in Cornwall comes to an end as the owner tells them he is leaving their flat. They return and from then on everything gets worse – much worse. Needless to say this is a complicated and complex story, perfectly paced as the secrets are revealed and the lies are exposed. The characterisation is good. As I read I grew to like Libby a lot but began to suspect that maybe she wasn’t as genuine as I first thought and Jamie’s attitude began to irritate me – signs that the characters are well drawn. At one point I began to get a glimmer about the truth as I realised how the Prologue fitted into the story. I was never really sure who I could believe, just who was telling the truth. It’s one of those books that keeps you guessing right up to the end and this one is excellent, dramatic, tense and so very, very twisty. My thanks to NetGalley and Penguin, the publishers for a review copy.